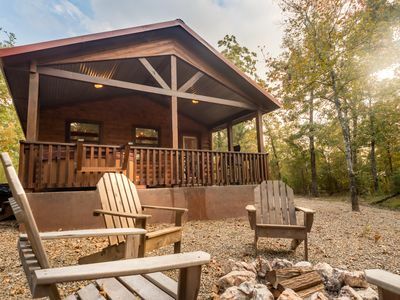 Located in the majestic new Pine Hill West subdivision, this cabin is just minutes from the shops and restaurants of Hochatown and the entrance to Broken Bow Lake with its world-class clear water, fantastic boating and skiing, and amazing fishing. 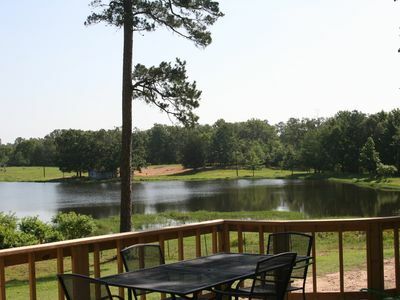 Inspired from the movie, Legends of the Fall will be a great getaway spot for you and your family. 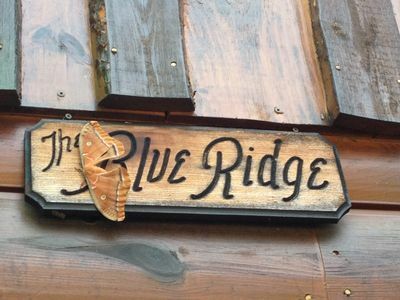 From the corner lot framed by a draw running into the woods to the panoramic deck around three sides complete with the crests of the forest around or the décor inside that makes you feel right at home, Legends of the Fall will be your escape. 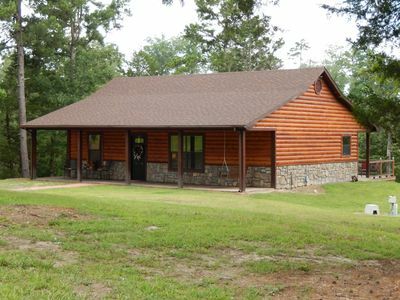 Completed in May 2017, Legends of the Fall is a 2,900 living ft 3 bedroom cabin with 4 baths and a spacious bunkroom with game room and loft living. 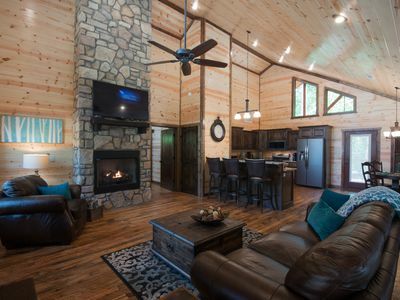 The cabin itself has a large living room with ample seating. You can dine at the huge island bar or dining table next to the kitchen. There’s a downstairs master bedroom with French doors to porches and two other bedrooms downstairs with their own bathrooms. All have King beds! 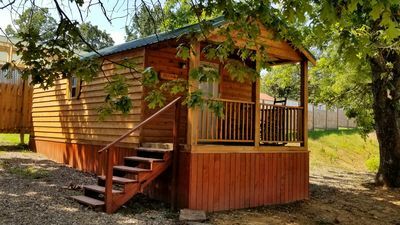 Upstairs is a large game room, ample seating and TV and 6 bunks for kids or adults. 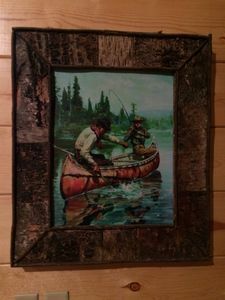 Although the inside of the cabin is great, the outside of the cabin is where it is at. 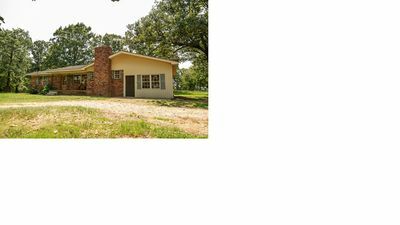 There is a wrap-around porch that faces the fire pit and horse shoe pits that you will enjoy watching all of the outdoor activities. 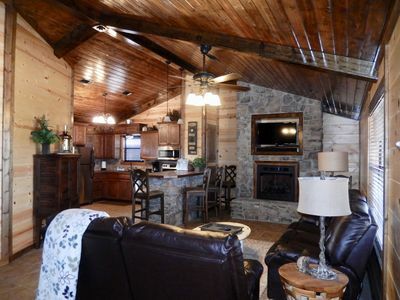 Also on porch near the outdoor fireplace is a large private hot tub that will fit up to 7 guests. 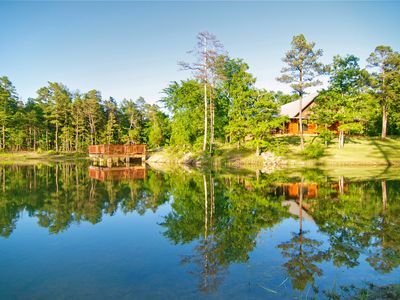 Hilltop Getaway: Luxury Cabin on 3 acres near Broken Bow - 10 Kayaks included! 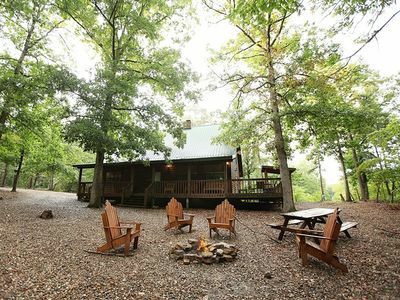 Hillside Hideaway: Romantic and Secluded Cabin on 3 acres - 10 Kayaks included! 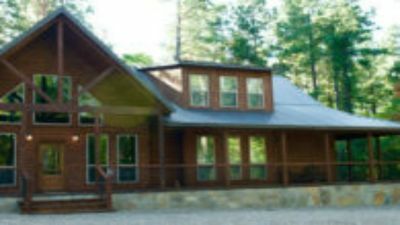 Southern Grace Great Family Cabin with lots of room. 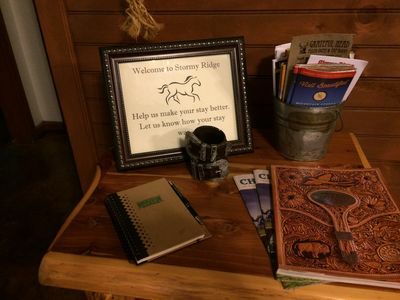 Book away and see ya soon! Rest! Rewind! Relax! Enjoy! 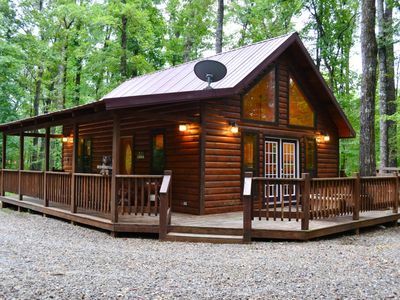 Peaceful open plan cabin with all the amenities!